Trying to outwit dry skin, whether it presents itself as tight cheeks and flaky patches or legs more parched than the Sahara, can be enough to make you miserable. Luckily, we’ve put together a list of the best dry skin lotions for both face and body to get you back to your happy, hydrated self. While each lotion offers something a little different to soothe and repair dry, irritated and cracked skin, there are some hero ingredients to look out for: glycerin is a good one for creating a barrier over skin, giving it a chance to heal, while nourishing natural oils and butters from sources such as avocado, cocoa and shea are time-tested favourites for intense hydration. Our overall best lotion for dry skin is the Ameliorate Transforming Body Lotion which, thanks to a formula that improves the appearance and feel of rough, dry skin by going straight to the source, comes highly recommended for those with the common complaint keratosis pilaris. For less specific complaints, there are rich butters and absorbent light creams aplenty, each with their own virtues to offer. As well as smoothing and soothing parched skin, this transformative body lotion is said to work wonders on otherwise impossible-to-budge keratosis pilaris, removing dead skin cells, unblocking follicles to sort out ingrown hairs, and generally improving the feel and appearance of dry skin all over the body – and quick sharp, too. Testers loved the fast-acting formula and its ability to see off redness and roughness, and found their skin felt hydrated all day. It’s easy to see why it’s hailed as a holy grail product, and as such, it takes our top spot. Smells gorgeous and softens beautifully – what’s not to love? While fragrance can be a bit of a thorny issue when it comes to skincare, if you don’t have ultra-sensitive skin and love a bit of perfume in your product, you might want to give this Clarins lotion a try. Reviewers raved about the beautiful scent, a fresh, springy combination of peach and orange blossom, as well as the finish: namely, non-sticky and incredibly hydrating. Users said it had a long-lasting effect and that formerly dry and flaky skin felt quenched all day after application in the morning. Allure magazine’s readership have given this Aveeno lotion their Reader’s Choice Award for ten years on the trot, which we think speaks volumes. It’s one of the most affordable options out there providing effective relief for dry skin, thanks in part to its combination of barrier-forming glycerin and naturally softening oatmeal, and the fact that it’s fragrance-free makes it less likely to irritate very sensitive skin. Many eczema sufferers recommend it as a non-greasy, non-sticky alternative to medicated creams, but you might want to clear any changes in your skincare routine with your doctor first. French brand La Roche-Posay specialise in targeted care for problem skin, and this wonder product is no exception. Specially formulated for painfully dry and eczema prone skin, it’s highly recommended for those who suffer from that irritating combination of dryness and sensitivity. As well as packing in rich, creamy shea butter for natural moisturisation, it adds glycerin and niacinamide to give the skin a chance to heal, and even prebiotics to stabilise your skin’s microbiome – that’s right, good bacteria isn’t just for your gut! 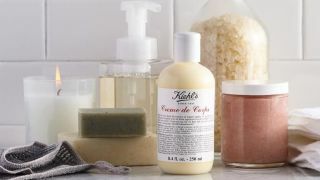 Kiehl’s Creme de Corps has long enjoyed cult status among those in the know, and with good reason, it seems. Very thirsty and flaky skin is sure to rejoice at the extra-rich creamy formula which, in true Kiehl’s style, is packed with nourishing natural ingredients like avocado oil and shea butter, and users have noted that despite its buttery feel, it absorbs quickly into the skin without leaving a greasy sheen. In fact, it’s so thick it can be difficult to squeeze from the bottle, so you might want to set aside some time to apply. Is it too much to ask to be silky smooth and smell delicious? We think not. That’s where Palmer’s Cocoa Butter has always shone, not only offering an ultra-thick and tangibly soothing cream formula, but a gourmand chocolate smell that’s good enough to eat (although we advise slathering it on thirsty skin instead). The rich emollient moisturiser leaves skin fabulously soft, of course, but this one has the added bonus of smoothing and helping to reduce the appearance of marks and scars. Check out our full round-up of the best face moisturisers for women.